You will recall that under provisions of the 2014 farm bill, landowners were given the opportunity to make a one-time election to keep existing crop bases on the farm as they were, or to update these bases. This decision applied to “covered commodities” only and excluded cotton. Bases of covered commodities (corn, peanuts, soybeans, wheat, grain sorghum, oats, sunflowers, canola, etc.) could be “retained” as they were as of September 30, 2013 or these bases could be “reallocated” based on the farm’s planting history for 2009-2012. 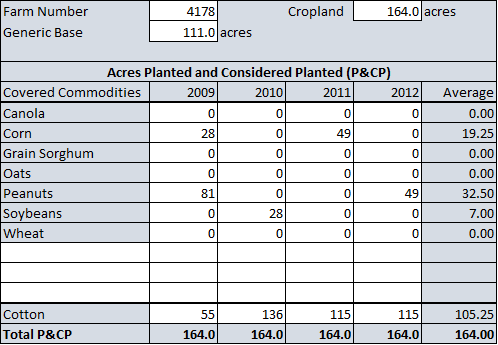 Total base acres of covered commodities could not be increased but could be “reshuffled” based on 2009-2012 planting. Since 2014, the generic base on a farm has just been sitting there. It has had no value for cotton, and cotton has had no income safety net, since cotton was not eligible for ARC/PLC payments. The only contribution generic base has had is the provision that says, acres planted to covered commodities on that farm can earn temporary base of the commodity and are eligible for ARC/PLC up to the amount of generic base. But this did nothing for cotton specifically. For several years, cotton industry leadership sought ways to improve the safety net for cotton producers, and to get cotton back in Title I and eligible for ARC/PLC. With the Bipartisan Budget Act of 2018, “seed cotton”—a combination of lint and seed, is now a covered commodity under Title I of the 2014 farm bill. This becomes effective with the 2018 crop year. Under the new seed cotton program, generic base on a farm will no longer be in effect starting with the 2018 crop year. Generic base must be converted to seed cotton base, or other covered commodity bases. If a farm has generic base (former cotton base under the 2008 farm bill) but no covered commodity (including cotton) has been planted on the farm during 2009-2016, all generic base on that farm will automatically become unassigned base and not eligible for ARC/PLC. Conversion options would not apply. Some have asked, why a more current planting history is not allowed? Remember that in the 2014 “retain or reallocate” decision, cotton was excluded. This new seed cotton program is simply going back to that same window of history given to other covered commodities (2009-2012), and now giving the landowner the opportunity of several alternatives to convert generic base or former cotton base to seed cotton base, or seed cotton base and bases of other covered commodities based on that same window of history. Option 1-A would result in 88.8 acres of seed cotton base, and 22.2 unassigned base acres. Potentially, every farm could be different, because of the amount of the generic base and planting history. It is possible, however, that your farms could be divided up into different “types” based on similar bases, planting history, and seed cotton payment yield and a decision made for choice of conversion option by type. Obviously, the major factor in the decision will be expected total ARC/PLC payments with each option. In the hypothetical example shown, Option 1-B gives the highest seed cotton base. Option 2 has less seed cotton base in exchange for corn, peanuts, and soybean base. Future ARC and PLC payments, and thus which conversion option may be best, depends on market prices, yields vs historical yields (for crops in ARC), and PLC reference prices. The University of Georgia Department of Agricultural and Applied Economics and UGA Cooperative Extension are developing a decision aid that will be available to assist producers and landowners to analyze the conversion options. The seed cotton program and conversion of generic base does not in any way impact your current crop bases for other covered commodities. The conversion will simply add to the other bases you may now have on the farm. 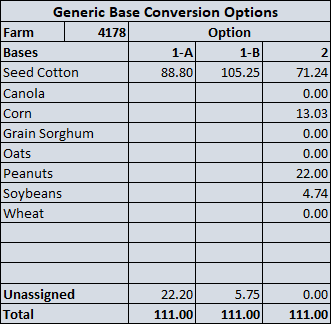 The decision regarding generic base conversion option is a farm-by-farm basis. You can select one option for one farm, and a different option for another farm. The treatment of any “unassigned base” in future farm bills is uncertain, and will likely depend on budget availability. Printer friendly versions of the three fact sheets that were developed to update farmers on the recent changes to the 2014 Farm Bill. Appreciation is expressed to the Georgia Cotton Commission and the Georgia Peanut Commission for funding support. Appreciation is expressed to the National Cotton Council for review and comment.